Port Orange is located south of the city of Daytona Beach, and is one of the principle cities of the Fun Coast region of Florida. 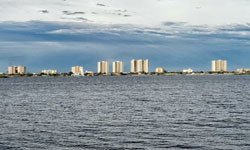 It is considered part of the Greater Daytona Beach Area and only recently obtained its own mailing address, separate from the city of Daytona Beach. Tourism marketing is the major industry and still ties Port Orange closely to Daytona Beach. The city of Port Orange was established in 1867 on the banks of the Halifax River as a “planned city.” It is 28 square miles in size, with tree-lined streets and 150 distinctly different neighborhoods. The city has a reputation as being a great place to live, work and play. Port Orange encompasses several beautiful parks and is home to over 50,000 residents. It’s home to one of the largest special events in Volusia County: The Port Orange Family Days, held in October. This four-day festival, which takes place at the City Center Complex, focuses on the celebration of family and the quality of life in Port Orange. The festival features a carnival, business and non-profit expo, children’s games, a parade, food court and other entertainment. Recent studies of Port Orange reveal a workforce that is educated, productive and competitive. Seven colleges and universities and the Advanced Technology Center support career advancement, workforce development and research. Tourism, education, health care and government are the area’s largest employment sectors. The city has started attracting high-tech companies as well. Public primary and secondary education is handled by Volusia County Schools. The schools in Port Orange are A-rated by the state, and one of the high schools, Spruce Creek High School, has made the list of one of the top 100 high schools in the nation for several years in a row. You can find almost any type of real estate in the area – from a small, one-bedroom condominium to a sprawling oceanfront estate. Living in Port Orange means having access to an abundance of things to see and do. You’ll find everything from quaint antique shops to large shopping malls, casual beachside dining to upscale restaurants. Also, Port Orange is within an hour’s drive to Disney World, Sea World, Epcot Center, historic St. Augustine and the Kennedy Space Center. The median home value in Port Orange, as of 2014, is $155,300. This is a rise of 14.9 percent and predictions are a rise of 7.1 percent within a year. The median list price of a home in Port Orange is $179,900 with the median price of homes sold being $155,300. The median rent price in Port Orange is $1,195, which is higher than the Daytona Beach Metro median of $1,100.